“Much of the contents of [Mann’s] book is old news“, according to Peter Gleick. In fact, an entire day spent at a website owned by somebody who interviewed the Man, has turned out nothing more than statements accompanied by “that’s nothing new” and “for those buried in the intellectual wastes of the Murdoch media – it will be brand new territory“. IOW the general consensus appears to be that there is nothing in Mann’s book that has not already been mentioned, described or referred to somewhere on the web (and, I suspect, in the Climategate emails). Somebody tried to make the point that, according to agiographers, Mann’s book contains enough “to spark a dozen Master’s theses“. But that is not the point. The point is, what would one find in Mann’s book that is nowhere else? Who knows…an insight, a revealing detail, whatever, anything as long as it is new. There has to be a reason to buy and then read the book, right? According to Mann’s own supporters, the answers to those questions are still “nothing” and “none”. Well, no wonder Mann is ever so bothered about his enemies…with friends like Mann’s, no one needs enemies! […] here are errors, as Mr. Kohn says, that ”are nothing to be ashamed of,” and he begins by considering some examples – in particular, those cases of collective error where a scientist’s initial mistake has been taken up and repeated by other scientists until it assumes the proportions of a mass delusion. As I already said, this stuff should be mandatory reading in all science schools. [One and a half centuries ago Magalotti wrote] in the Family Letters: “It is certain that seasons’ natural order is worsening. Here in Italy it is common saying and lamentation that the half-seasons have disappeared; and in this confusion, it’s without doubt that the cold is advancing. I have heard my father that in his youth, in Rome, on the morning of Easter Sunday, everybody would change into summer clothes. Nowadays whoever can afford not to sell his shirt, I can tell you he’s very careful not to abandon any winter piece of clothing”. This is what Magalotti wrote in 1683. So you’ve finally realized there’s a set of simple innovations that could save the lives of millions right now, help the environment and perhaps even slow down global warming (see John Tierney’s “A renegade climate idea that could work“, IHT, Jan 18, 2012). The fact that those actions have been neglected thus far because of lack of “glamour” and an obsession with cutting carbon dioxide emissions tells everything one needs to know about the inhumanity sadly intrinsic to many environmental activist organizations. Humans are not vermin. Children dying as we speak because of black carbon filling their lungs in windowless huts are not trade-offs to sacrifice in a fight to convince the world to use fewer SUVs. Prof Roger Pielke Jr’s “iron law of climate policy” says CO2 emission cuts policies always lose against economic growth pushes. Such a rule ought to be expanded : because we’re humans, and we should remember our humanity. Therefore policies that save human lives have to take precedence over attempts at defining global environment-related treaties. Always. I recently surmised Peter Gleick be an astroturfer trained to make greens look less than…bright. This article would be compatible with that hypothesis, as the author shows no grasp of the history of climate, including what are known as Younger Dryas and the PETM. It should also be obvious to all that the longer we look in the past, the lower our ability will be to discern one decade from another, and then one century from another. 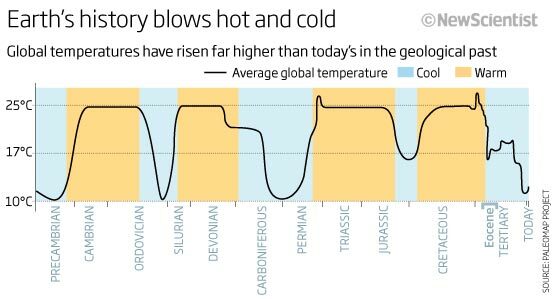 The climate might as well have changed dramatically every year a million years ago, still the paleo traces will only show some kind of long-term average of it. We cannot seriously compare contemporary records with those of the past without considering that. It would be like saying more things happen now than in the Middle Ages just because more people write now than in the Middle Ages. The continuous mentioning of the fabulously flawed 97% figure (it’s 97% of 77 out of 1,372) is just the cherry on the cake. Is Exxon funding the Pacific Institute? And yes, our current climate WARMING catastrophe is at the bottom right. We present reconstructions of Northern and Southern Hemisphere mean surface temperature over the past two millennia based on high-resolution ‘proxy’ temperature data which retain millennial-scale variability. These reconstructions indicate that late 20th century warmth is unprecedented for at least roughly the past two millennia for the Northern Hemisphere. Conclusions for the Southern Hemisphere and global mean temperature are limited by the sparseness of available proxy data in the Southern Hemisphere at present. Reconstructions of hemispheric mean temperatures over roughly the past two millennia employing proxy surface temperature data networks with sufficient spatial and seasonal sampling, temporal resolution, and retention of millennial-scale variance, support previous conclusions with regard to the anomalous nature of late 20th century temperature at least about two millennia back in time for the Northern Hemisphere. To the extent that a ‘Medieval’ interval of moderately warmer conditions can be defined from about AD 800– 1400, any hemispheric warmth during that interval is dwarfed in magnitude by late 20th century warmth. The sparseness of the available proxy data in the Southern Hemisphere lead to less definitive conclusions for the SH or global mean temperature at present.